It’s Energy Saving Week, so it’s highly applicable that we bring you a device that will help you monitor your energy usage – and through being aware of how much power you’re using, lower the amount you use. 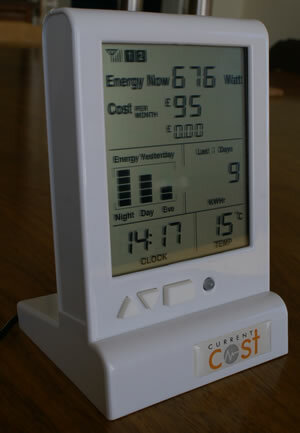 CurrentCost is one such device. The video below shows what happened when we received the Current Cost and quite how easy it is to setup. The summary – amazingly easy. Within about five minutes you’ll be watching your pounds drain away on electricity! It’s fascinating how it changes your behaviour as you become aware of which of your appliances use the most power – power showers are truly frightening and toasters and kettles will surprise you too. The first night we run the Current Cost, we sat in near-darkness trying to reduce our usage to a minimum. Since then normality has returned, but we’re turning lights off in rooms that we’re not using far more frequently. We’re going to run the Current Cost for a while before we give our concluding review, so watch out for it.